Notre maison de vacances est idéale pour les familles avec enfants, des tout-petits aux adolescents. Nous le savons de par notre expérience directe, car nous sommes l’un des propriétaires initiaux qui ont acheté des plans à Windsor Hills il ya près de 15 ans. 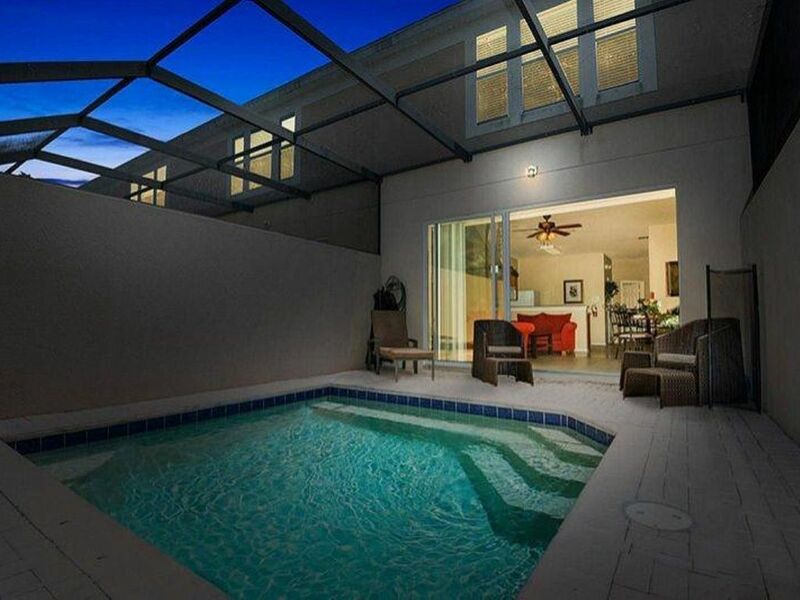 Comme nous visitons la Floride chaque année pendant plusieurs semaines, nous apprécions cette maison autant que nos invités. Nous avons acheté une maison en rangée sur un terrain de choix qui a un grand espace ouvert derrière, de sorte que les autres maisons en rangée ne la négligent pas et donne beaucoup plus d'intimité que de nombreuses autres maisons. C’est quelque chose que nos invités nous disent qu’ils ont vraiment apprécié. Veuillez vérifier ceci lorsque vous comparez des maisons en rangée sur le complexe. Maison sans fumée et sans animaux domestiques. Nous gérons nos réservations directement nous-mêmes car nous savons ce que les familles ont besoin de leurs maisons de vacances. Nous sommes très heureux de donner des conseils sur l'achat de billets pour l'attraction, la location de voiture, tout ce qui fait partie de vos vacances. Tout cela fait partie du service de réservation directe avec les propriétaires qui se soucient de leur maison et de leurs invités. Windsor Hills est un complexe exclusif situé au cœur de Kissimmee, à Orlando. Son emplacement fantastique n’est que l’une de ses caractéristiques exceptionnelles. Il se trouve à seulement quelques kilomètres de Disney World et permet de rejoindre facilement les principales attractions d'Orlando, telles que Universal Studios et International Drive. Cette communauté privée est idéale pour la famille et les amis et dispose de superbes installations. La piscine avec toboggans pour enfants est le point central du complexe. Il y a une salle de fitness et la salle de jeux avec tables de billard, ping-pong et jeux vidéo. Le club sur place possède également une petite salle de cinéma et un dépanneur pour la nourriture et autres produits de première nécessité, vendant désormais des boissons pour adultes au bord de la piscine. Very nice I will b back thank you. This unit is well stocked and well located in the Windsor Hills complex. Close enough to club house that you can easily walk to it. Parking for second car is right across the street. When we arrived, the unit looked and smelled very clean. Kudos to the cleaning crew. The unit is tastefully decorated throughout. Prior to arrival, you will want to stock up on paper towels, soap, toilet paper, etc. Kitchen has enough plates, cups, glasses and utensils for you to prepare meals, including non-breakable plates and bowls for children. The only thing I found missing was potholders. Had I noticed this before I had dinner in the oven, I would have bought a Disney set and left it for the next guest. Kitchen appliances were rather basic, but functional. Everything was in working order. Samsung washer and dryer upstairs worked well for us. Provide your own detergent. Bedrooms were all nicely decorated. Granddaughter enjoyed the Disney theme and the ‘hidden Mickey’ in her room. Splash pool in back had a couple of beach balls and noodles, which the granddaughter greatly enjoyed. Children safety features should provide reassurance to parents of younger children. The pool is regularly maintained and was very clean. During our trip, the temperature varied from a high of 66 to 88. The A/C handled this well and there were no complaints. Wifi was a bit spotty. We all had trouble with it dropping at times. When I sat by pool, coverage was very spotty. There is a lot to do within the Windsor Hills complex. Movies, pool, water slides, game room, etc. Also, limited menu at the club house in case you don’t want to brave the traffic one more time. It is very close to a Wal-Mart, Target and Publix. The Wal-Mart is the closest of the three, but beware, it is the busiest Wal-Mart you will ever find. It does have a nice selection of Disney themed merchandise in case you haven’t yet had your fill. The reason I give this unit 4 stars is that some of my party complained of hard beds and we all found the couches to be uncomfortable. I personally found the beds to be not as hard as ones I came across in Europe, but certainly not as soft as the one I use at home. It’s personal choice, so it might be fine for you. But, the couches definitely need to be replaced. We would definitely stay here again. Love the Windsor Hills complex. The owners were very responsive to every inquiry that I had no matter how trivial. Thank you! Good location as near to entrance to Disney and plenty of local places to eat. 5 minutes walk to community pool. We are a retired couple and it suited us just fine. And yes we are still doing Disney at our age! The property was excellent. My only complaint was the the washer and dryer did not work during our stay. However the owner made an adjustment to our rental to compensate. Thank you very much for your review and thank you for your flexibility - we were pleased to extend your stay. The new Samsung washer and dryer are now installed. Overall our stay was amazing. Pros: The house was more than big enough for our family. It was clean and decorated as listed. The owner was very nice to work with. I had several questions before our trip and received responses for all and was very accommodating. The community pool area was amazing!! Community was huge, warm and beautiful. The club house was awesome too! We had lunch there a few times. It had everything you might need without having to run to walmart. Walmart is super close but always a mad house. Clubhouse had pool tables and games. We didn’t spend a lot of time here since we were focused on parks but wish we would have made more time to enjoy it. The location can not be beat. We could not get any closer to the parks, Walmart, and other food without being on Disney property. It was perfect location. I can’t stress the location enough. Cons: The house did not have enough rags and towels which was an issue for us. We were a party of 4 adults and a toddler. We went to park almost everyday and did not have time to wash everyday. The manager (which is not the owner) was not helpful at all. I had to and buy more rags and towels. Not what I was expecting. I expect to buy more toilet paper and paper towels but not rags and towels. The pool at the house was supposed to be heated and was not. Manager had to have someone come out and fix it which wasn’t the day we planned to us it. We didnt use it the whole trip. That was a huge bummer since we picked this house for its pool. Overall, I would def stay here again. The owner was great and the house was great. Exactly what I was looking for. Thank you so much for letting us stay! Amazing first time visit to Florida!! We loved staying here! The home was exactly as advertised. Home owners were very easy to reach before and during our stay. When I couldn’t find the blender listed in the ad, I let Amanda know and there was a brand new one there that night. As well as a replaced outdoor bulb. The home was clean, well equipped ( yes you need to buy your own dish and laundry soap) and more than enough space for our family of 4. The private pool was great to have!! Although a little warm for my liking (we asked for heated), this was easily fixed as there was a hose right there to add cold water as needed. The house was a short walk to the larger pool and 15 minutes to all the Disney parks. A Walmart and lots of other shopping and restaurants close by made this a great central location and easy to navigate for us first timers. Windsor hills is a great place to stay, these home owners are great to rent from and we will be back!! Thank you!